Yes, I know. JavaOne is about Duke, the friendly mascot of Java technology. Created and maintained by James Gosling and all. But MySQL also introduces Sakila to the JavaOne attendees. Sakila is also friendly, and the mascot of MySQL technology. The dolphin was chosen by MySQL founders Michael "Monty" Widenius and David Axmark, as was its name Sakila (which came from a naming contest in the early days). Ah, and rumour has it that Jonathan may pop in during Giuseppe's presentation! Come, ask a smart question, interact, and get a Sakila! Barton is a colleague from Sun, who "looks after Sun's relationships with the various GNU/Linux communities as well as our relationship with the FSF" according to his blog. I spent time with him at the MySQL Users Conference last week. He is a fun guy to be around, and isn't as US-centric as his remark "Last year, my family and I emigrated from Silicon Valley to Austin, TX." would lead one to believe. As for blogging, he has recent MySQL relevant entries on partying (with MÃƒÂ¥rten of MySQL, and with Jonathan & Rich of Sun at the Pre-Conf Community Dinner), and with pics from the UC. As for podcasts, he has already posted four entries from the MySQL UC, i.e. interviews with MÃƒÂ¥rten Mickos, with Zack Urlocker, with Baron Schwartz of Maatkit & Community Award fame, and with Jennifer Venable of Red Hat. Barton tells me there will be more podcasts posted soon, with Brian Aker of MySQL (now live! ), and with Erica Brescia, CEO of BitRock (now also live!). Second, I am a big fan of descriptive subject headers. So I thought I could promote this memorable event even more explicitly than what Jay did in his posting "Yes, It's That Time of the Year Again...". It's Julian's fault that I bought my 8mm Sigma lens. He has one, and takes weird pictures with it. As opposed to mine, his are good (yup, he uses fancy high-tech equipment like flashes, and white background paper -- one day I'll go there, too). This is MySQL's very own Brian Aker, as distorted by Julian. The new thing Julian is doing is Light Painting. This means he creates pictures that look like they've been PhotoShopped through some strange filter, but they haven't. Light painting portraits are distinctive, innovative, and magical. The photos have a dreamlike futuristic feel and lend themselves to editorial work, advertising, book covers, and portraits of musicians. I do not digitally manipulate the images. All of the effects are created simply by painting the subject and the surrounding area with colored light in a dark room while the camera shutter is open. This makes for images that feel especially organic and believable despite their surreal nature. My subjects and I have a great time creating light portraits together. The style of the images is both unique and varied. My proficiency comes from 15 years of experience and experimentation with this type of photography. It also helps that I am an illustrator and painter as well as a portrait photographer. The process is fun and is a natural combination of painting and photography. If there is a concept or emotion that you want expressed in the image, I especially enjoy using that as part of the creative process. I'm happy to work with an art director, or I can take the initiative to come up with a powerful and satisfying image. So if you're at the UC, do stop by at Julian's event and have your picture taken! There's a reason for Sheeri winning the Community Advocate of the Year award. Her activity level is hard to beat. If you want a chance to beat Sheeri for 2009, you need to master multitasking. Not only is Sheeri listening to MÃƒÂ¥rten presenting his keynote. She's preparing for some vlogging, i.e. recording MÃƒÂ¥rten's presentation. And she's blogging at the same time. And (although she doesn't know it until three seconds after the picture was taken) she's getting ready for getting up on stage to receive her 2008 award. Ah, myself I'm only listening, and taking the odd picture. (Some of them very odd). The very first UC related parties are over, and the Users Conference hasn't even started! The first one was MÃƒÂ¥rten's traditional and well-liked MySQL staff party in his garden. The coolest and most community significant one was the MySQL Community Pre-Conference Dinner party, though, as advertised on MySQL Forge Wiki. So we dropped out of MÃƒÂ¥rten's party at six, to meet with the community. Given that we've got record number of attendees at the UC, I think I will have to speed up my discussions, as I got to talk properly only with Florian Haas and Philipp Reisner of Linbit / DRBD, with Kai 'Oswald' Seidler of XAMPP, with Marc Delisle of phpMyAdmin, with Volker Oboda of Primebase, other than the MySQLers, ex-MySQLers and Sun employees. Note to self: Blame the jet lag, as this is my second Sunday 13 April 2008 (having got up in Tokyo at 7, and left Tokyo at 16, and arrived in San Francisco at 9 i.e. 7 hours before leaving). And it seems I also blew my opportunity of flying Decadence Airlines again anytime soon. I was going to handle the payment using Rich Green's credit card (Rich had to leave a bit earlier), but the restaurant gave him back the credit card and left me with merely signing a receipt. This isn't going to buy me any aircraft fuel on Netjets. Footnote 1: Yes, I was teased all evening for the four days we flew "Sun's Corporate Jet", i.e. a rental airplane by Netjets from Dublin via Stockholm, Moscow, Izhevsk, Moscow again, and Kiev to Hamburg in March. But it was good, so I suppose I deserve some teasing. Footnote 2: I googled for "Decadence Airlines", and funnily enough, one of the links goes directly to http://www.netjetseurope.com/eng/welcome-to-netjets/. I think I will have to plead guilty to that one. My Japan trip was full of meetings, as trips to Japan usually are. One of the most interesting ones was at Sun Microsystems K.K. 's site, with a number of people engaged in building Japanese communities for Sun. From Jim Grisanzio and others, I learned that Japan is Sun's most active blogging country outside the US, on blogs.sun.com. And I got reminded of the messages heard many times at numerous Sun meetings: That Sun has Community experts both in Marketing and Engineering. On the contrary, MySQL's Community Team is a separate entity, outside of both Marketing and Engineering, but serving them both. And that's an area where MySQL and Sun has a lot to discuss about, in order to understand if there is something to learn from the other party, and how the learnings can be applied and implemented in practise. There is at least one area where MySQL can learn and contemplate how to implement Sun's practices: Developer Marketing. We have never used those two words in combination at MySQL, which at times also means that a certain group of MySQL users fall between the cracks -- those who contribute to the MySQL community but work for commercial customers. The Community Team socialises with them at Dev Mtgs (such as in Heidelberg last year) and at the Users Conference, and so do the Sales Engineers, Support Engineers and everyone else working for MySQL. Yet, spending time isn't the same as concerted efforts. Conversely, the concept of "user" seems to be different at MySQL and Sun. At MySQL, "user" is often used to mean "non-paying customer". And these users form the core of the charter of the Community Team. We want to smoothen the way for our users, we want them to use MySQL, to expand their usage of and benefit from MySQL, and to share their positive experiences with the rest of the world. And while working on this, the MySQL Community Team strictly does not have an agenda of convincing the users to pay for something, ASAP. Sure, we want our pay check, and sure, we want MySQL (now Sun) to prosper financially. But our main goal is to fill the invisible pipeline of users who may take months or years at the user stage, before even considering to become paying customers. Some of this forces top management to have quite a strong belief in the good that a community can have for a company. I'm thinking about metrics. It's not as if there would be ideal metrics for community building. Or rather, there are ideal metrics, such as the number of project wins, i.e. cases where MySQL is being adopted in new projects. That would be highly relevant to know, segmented by various types of organisations. But we don't have access to those numbers. Forcing people to register won't work, and voluntary registration gives only a fraction of the new projects as well as a fraction of the relevant data. My personal conclusion is that I'd rather have a high adoption rate, than know exactly which low adoption rate I have. And another personal conclusion is that I'd generally rather spend time increasing adoption further, than increasing my level of knowledge of that adoption. That conclusion is less easy to defend, though, as some level of knowledge about adoption rates is essential. What's again easier to defend is that exact knowledge about an irrelevant aspect of the adoption rate may fool one to believe that said aspect is relevant. How significant is download rates? Web page hits? Email list traffic? Number of blog postings? Forum entries? And how much of that is directly driven by the efforts of the Community Team, rather than events outside the control of that team (such as new releases, security holes, acquisitions by Sun)? Looking forward to various discussions on this topic with Ian Murdock and many other colleagues! Japan is a wonderful place for someone like me. Not only do I get to have sushi to my heart's content. I am also exposed to the wonders of the Japanese culture, and -- the topic of this blog posting -- Japanese cultural imports from the West. While preparing for the Sun-MySQL event last Wednesday, I was happy to see the back of Toru Takahashi-san's laptop, featuring a big sticker with Snusmumriken and a small sticker with Duke. Toru-san is a Principal Solution Architect with the Software Practice in Sun Microsystems K.K. 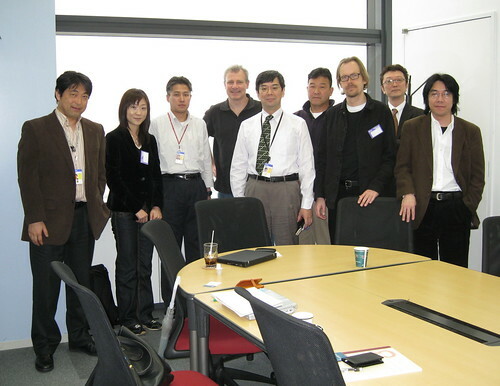 He was involved in the planning and execution of the Tokyo event in our Sun-MySQL World Tour. You can also meet him at the MySQL Users Conference next week, if you're there. Duke is the friendly mascot of Java technology. Snusmumriken, or Snufkin in English (sorry, I wouldn't know what he is called in Japanese), is a Finland Swedish cultural export. He is one of the Moomin cartoons (Moomintroll's best friend, who goes south every winter and returns in the spring), and I did know from earlier travels to Japan that the Moomins are about as popular in Japan as Victoria and David Beckham (exposure in random unrelated ads in the metro or on the streets). Ah, the humble cultural imperialist in me was happy to note that it's not only IT (Linux, MySQL) which is spreading from our tiny group of 300.000 people in Finland, but also my favourite children's stories, written by Tove Jansson (1914-2001). My Finland Swedish ego trip got a further highlight later in the evening, when I noticed that the scissors I borrowed at Larry Stefonic's place (MySQL's VP Sales in APAC) were made by Fiskars (in the consumer goods industry). I had the opportunity to keynote 60 minutes on the MySQL Architecture of Participation, with the first 5 minutes in Japanese. Konotabi wa, Sun Microsystems toh MySQL AB no Tougou ni tsuite, *Kigaru* ni *Oiwai* shi, *Hanashiau* tameno, Launch Event he, Youkoso Okoshi Kudasaimashita. Minasama wa, Mou, Owakari kato Omoimasuga, Watashi wa Nihongo wo *Hanashi masen*. Desukara, Minasama kara Question wo Oukesuru toki wa, honyaku shi, Eigo de, Kaitou sasete itadakitaito Omoimasu. As I'm sure you've noticed by now, I *don't* speak Japanese, which means that I'll rely on translations for understanding your questions, and I will reply in English. My "limitations" in Japanese were sorely apparent by the time I mentioned that, and surely enough, there were a couple of Japanese chuckles in the audience. The Q&A then started with an intensity of questions that I am used to from my native Finland, in other words, complete silence. After the first brave Samurai opening up the q&a session, the questions started flowing and were of the same type as elsewhere: What are our plans for storage engines? What does the Sun integration mean? Will Sun change us? Will we stay open source? (Yes, we will). Thanks to Yoko Suga-san, and everyone at MySQL KK and Sun KK who made this great event such a success! Right after Paris, Giuseppe and I turned our attention to Milan, Italy. The flight from Paris Roissy to Milan Malpensa (EasyJet, 57 euros/PAX) turned out to be clearly cheaper than the taxi ride from Malpensa to Sun's Milan office, where we had the meetup. In time before the meeting, we had some HR, integration and general planning discussions with Sun. One of the most difficult aspects turned out to be to pick the right form of coffee, as the number of alternatives in the coffee machine exceeded anything observed before. Luckily, I'm a tea drinker, where the challenge limited itself to finding out how to change the default of adding sugar to drinking the tea straight. The event saw over 100 participants. It was very competently arranged by Emanuela Giannetta, hosted and supported by Franco Roman and many other Italian Sun people -- including Stefano De Toni who presented the GlassFish Application Server and NetBeans platform/IDE projects. Signore e signori, benvenuti a questo incontro informale per celebrare e discUtere l'acquisizione di MySQL da parte di Sun Microsystems. Mi chiamo Kaj ArnÃƒÂ¶, e sono il Vice Presidente per la ComunitÃƒÂ di MySQL. Vengo da Monaco, ma non sono bavarese. Sono Finlandese come Monty, il creatore di MySQL e molti altri colleghi. Durante l'integrazione con Sun, ho anche il ruolo di Ambasciatore di MySQL, cioÃƒÂ¨ vIsito tutti gli uffici Sun e spiego cos'ÃƒÂ¨ MySQL. You might nOtice some non-standard capitalisAtion of a few words, denoting where to put the stress. How else would a stupid foreigner like me know it's discUtere and not discutEre? I didn't get thrown at with raw eggs and tomatoes (perhaps the audience was just unprepared) so until further notice, I will continue the practice of presenting the beginning of my keynotes in the local language.